We started from the National Trust car park at Hillsford Bridge, tucked away through a gateway on the western side of the crossroads. We walked up the main A39 road until a hairpin bend, and then passed straight on into the bridle way which leads up through the Lyn Valley Woodlands Nature Reserve. We emerged from the woods where a hump on the left marked an ancient settlement, and from here on there were marvellous views, firstly over Watersmeet. With August and the summer now in terminal decline, the constant downpour had been replaced momentarily with a thick slab of sweaty grey cloud. Drizzle was never far away and hung in the valley like smoke. 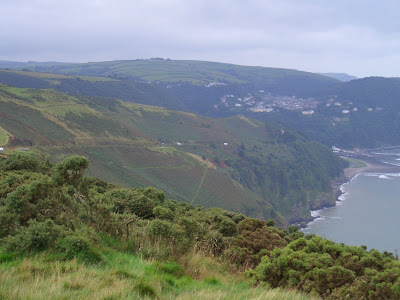 As the path wound around the top of Myrtleberry Cleave, with the muffled but constant roar of the East Lynn River beneath us, we eventually found ourselves looking down the valley towards Lynmouth with its tongue of surf distant on the shoreline. We ignored all the paths to the right which would have taken us the nearest way into the town, and waited until we could zigzag down through the woods until we emerged at the foot of the gorge at Lynbridge and crossed the river by the foot bridge. A chilly sense of tragedy lurks here. 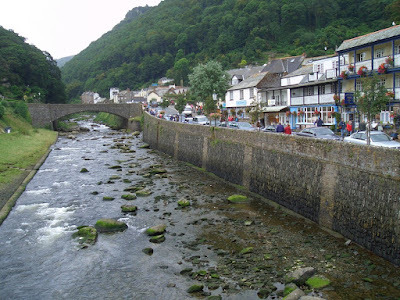 To someone of my generation, Lynton and Lynmouth are associated forever with the appalling floods of 1952 in which thirty five people perished. The disaster coincided with the period in which television sets became popular, in preparation for the coronation planned for the next year. Family friends had a set which provided this five year old with a gallery of shocking images he would never forget – the broken little Devon town, shattered by mud, rocks and water, and then a month later the death of John Cobb on Loch Ness, his speed boat spinning in its fatal somersault, disappearing in a cloud of spray and debris. These images remain necessarily frozen in black and white, but then it was a monochrome morning as we crossed the road and headed up a lane marked as a no-through road. It took us along the top of the gorge towards the town, the way shadowed by arches of dripping trees, while below it were the roofs of houses clinging to the cliff-face. It must have taken an extraordinary effort by the Victorian and Edwardian developers of Lynton to build these villas almost hovering in mid-air. The most remarkable, perhaps, is Lynhurst which is let as a luxury holiday home, and is all gables, balconies, and bay windows, fearlessly defying gravity high above the town. Just past the entrance to Lynhurst, the road runs down into Lynton town centre, and we walked up Allerford Terrace in an attempt to bypass it. We did so, but then made a bad mistake. 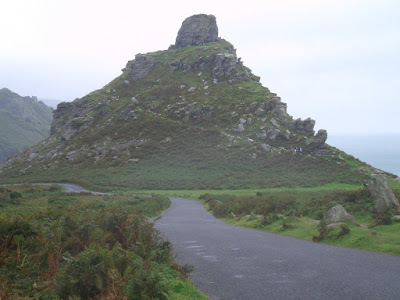 Instead of a left and a right turn which would have taken us to the Valley of Rocks by a footpath, I was seduced by a road sign to the Valley which took us out of the town by a main road bordered by guest houses and a disgracefully overgrown cemetery which had a First World War memorial at its gate. Unfortunately, it also led us into the Valley past the scenic National Park public conveniences and Mother Meldrum’s teashop, promising the delights of its Ragged Jack buns. Ragged Jack, of course, is the Valley’s signature feature. I am unable to comment on the eponymous confectionery. 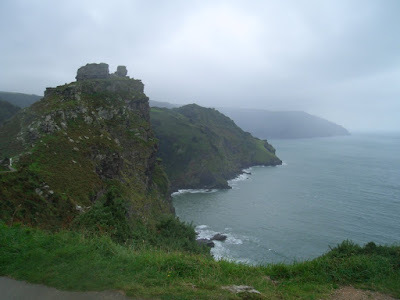 As we turned on to the coastal path, there is a marvellous view westwards Castle Rock. The path is metalled and a popular walk out of the town for those who scorn use of the two capacious car parks in the Valley itself. Eventually a rougher track forks off to the left, and we took it so that we would come out at the edge of the Western Beach and the harbour. We passed a curious notice warning against explosive mines being used for animal control. They were said to be “humane”, which presumably meant that the mole or whatever didn’t feel anything but a warm, cosy glow when blown to smithereens. 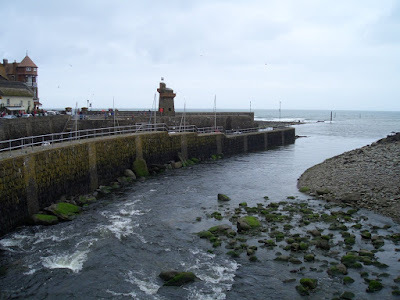 We emerged at the bottom of the cliff into a horde of motorists attempting to find a parking space, and smugly threaded our way towards the harbour, past the award-winning fish and chipper and its long queue, to the footbridge near the landmark Rhenish Tower. The channel for the river is remarkably wide, presumably as a flood defence. After passing the pitch and putt course, the coastal path up Countisbury Hill is clearly signed. We began our ascent of this notorious incline, although a combination of modern road construction and user-friendly gear boxes has tamed the beast since my Auntie Mary became stuck here in the 1950’s, unable to go forwards and too frightened to reverse. 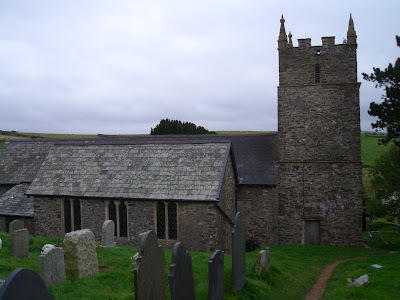 For a pedestrian it’s quite a climb but a pretty steady one, and eventually the tower of Countisbury church popped up over the skyline and the job was done. 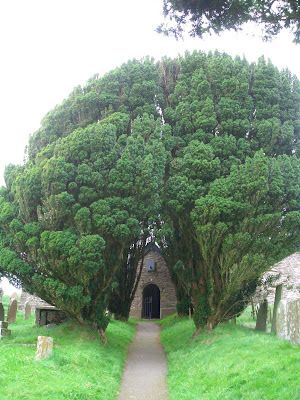 We passed through the churchyard and under the arch of yews, and there was the Blue Ball in front of us. Beers on tap were Exmoor, St Austell, and “Blue Ball Ale”. We couldn’t resist the latter, even when we discovered that it wasn’t homebrew but our old friend Cousin Jack in disguise. It was served at just the right temperature and made excellent drinking, proving that a pint of old-fashioned boy’s bitter sometimes slips down just as well as a high-alcohol speciality. Food is middle of the road, both in price and variety. Baguettes and filled spuds were change from a fiver, and mains were £8.95. The blackboard is half way down the bar area. 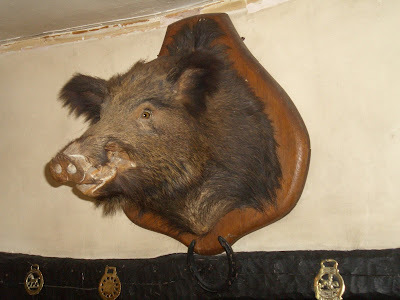 On the wall is a magnificent boar’s head. One recent landlord even re-named the pub the “Blue Boar”, but when he left for America he took the head with him. The present incumbent went out and found another. We knew the way well back to Hillsford Bridge. 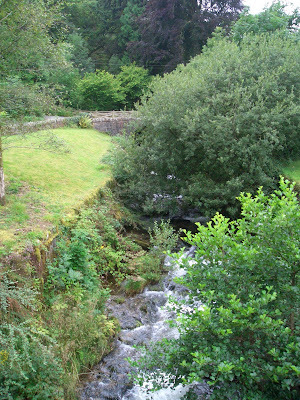 We took the bridle way just above the pub which leads down to Watersmeet, and then hiked up the river bank back to our truck. 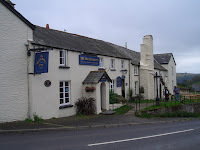 I will be staying in a lovely luxury hotels in devon really looking forward to my break near the coastal path it sounds so friendly and a warm atmosphere be surte we will be doing the pub walk along side the south coastal as what is life but to enjoy good beer and nature! 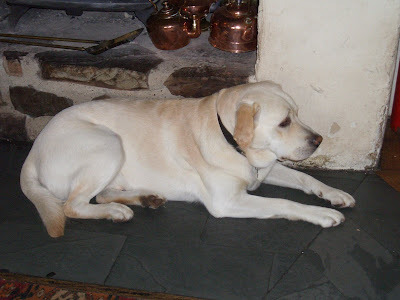 Our objective was to walk to every pub on Exmoor. We enjoyed these walks and pubs. You may too. Just put a pub or a location into the search box to find a walk. Two walkers, two drinkers. One writer, one photographer. 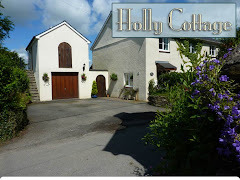 Try out some of our walks and stay at Holly Cottage B&B, Stoke Rivers, located on the edge of Exmoor. Click on link at foot of page.